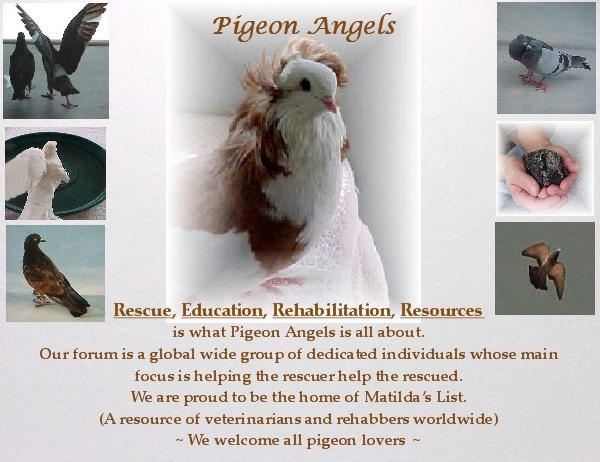 I work at Folly Wildlife Rescue in Kent, UK, and am wondering if there are any people in the South East that have aviaries to rehome disabled feral/fancy pigeons? I will be thinking positive thoughts that you are able to line up some wonderful forever homes to those pigeons rescued that turn out to be unreleasable. I'm going to post a link to this thread on our FB page. Thank you! That's a great idea. I will do the same on Folly's fan page but I thought I'd try Pij n angels first since it's all about pigeons here! I believe one "tweets" on Twitter! When I first saw your earlier post, Charis, I was thinking, "FB??? What's that??" But now I finally get it! ahhh, Yesss: Facebook! I refuse to get an account, b/c I already spend too much of my free time on the Net. Does PA have its own facebook page then? That's neat. Good luck finding homes for your sweeties, Mrs. AR. I wish I could adopt some... but I'm too far away. I'm sending positive thoughts your way as well. Thank you all for your support. I hope I get a few people come forward who want to care for lovely pigeons! Eventually, I think you will. We will just keep reminding folks.